Danish non-profit organization Realdania Byg commissioned Vandkunsten architecture studio to design a holiday house that combines the most up-to-date construction techniques with local traditional materials. 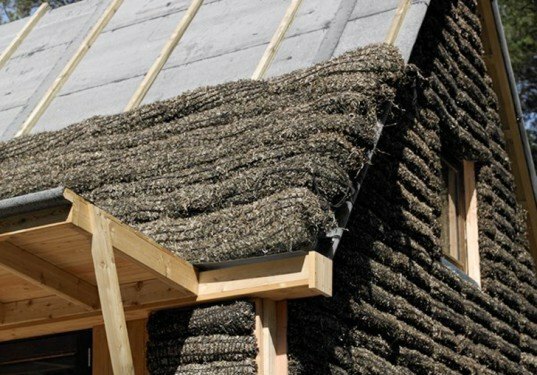 The architects designed and built a traditional house clad in seaweed—a material that was once used in hundreds of homes on then Danish island of Læsø, of which only 20 remain today. In addition to being non-toxic and fireproof, seaweed has been proven to have insulating properties as good as those of commonly used mineral insulation. It has fantastic acoustic properties, reproduces itself every year without any human involvement and has a life cycle of more than 150 years. It is in many regards the “ultimate sustainable material,” claims Realdania Byg’s Jørgen Søndermark. The architects decided to stuff the seaweed into netted bags and distribute it all over the façade. The interior walls, lined with wood, frame spaces for two families with living room and kitchen located in the center of the building. Besides building a band new house clad in seaweed, Realdania Byg has also restored the roof of one of the neighboring houses. The team hopes that these two projects will help promote seaweed as a viable building material and preserve the traditional architecture of the region. Seaweed is non-toxic and fireproof. Seaweed has proven to have as good insulating properties as commonly used mineral insulation. It has fantastic acoustic properties. It reproduces itself every year without any human involvement. Seaweed has a life cycle of more than 150 years. It is in many regards the ultimate sustainable material, claims Realdania Byg's Jørgen Søndermark. The architects decided to stuff the seaweed into netted bags and distribute it all over the façade. The interior walls are lined with wood. The interior walls frame spaces for two families. The living room and kitchen located in the center of the building. 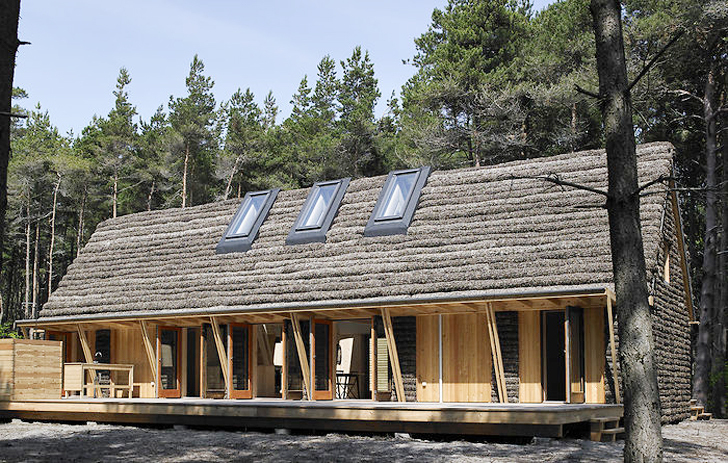 Besides building a band new house clad in seaweed, Realdania Byg has also restored the roof of one of the neighboring houses. The team hopes that these two projects will help promote seaweed as a viable building material and preserve the traditional architecture of the region.